Uh-oh, my 15 minutes of fame on TV is out and might be up. 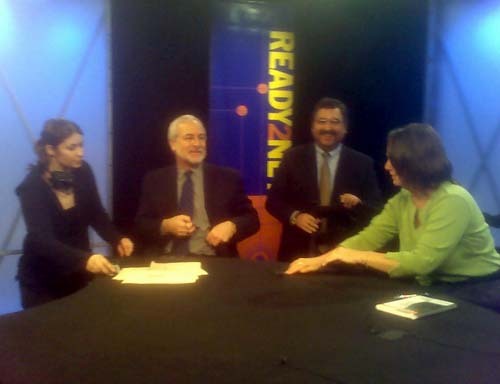 As previously noted, a few weeks back, I flew in and out of San Jose to be a panelist on the Ready2Net panel on “Web 2.0 Comes to Campus” (Drat you Bryan Alexander, likely too busy yourself, you should have been there instead of me!). The entire show is now online — note that the first half was the “industry” panel, with speakers from Microspft, Blackboard, etc on their perspective on web2… then the academics. I cannot say for sure if I said anything memorable, besides, “In Second Life I am a dog!”, but I thank Casey Green and the crew from CSU Montery Bay (it was worth going just to see John Ittelson’s new tech gadgets), as well as fellow panelists Gil Gonzales (colleague from days when we both were at Maricopa), new colleague Sandra Rotenberg (I got her hooked on twitter while we waited in the green room), and Rich Pickett from San Diego State. 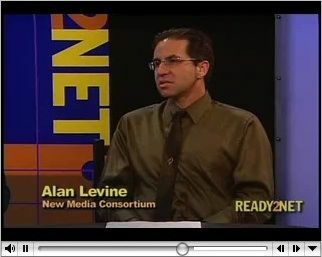 Hopefully, I was miserable enough that no one will ever invite me back in front of the camera. So that’s what you look like ;-) … I’ll have to watch this tomorrow. Ittleson always has the best stuff and Casey is always so silky smooth. That’s not me, its an avatar. Yes, I was already booked months ahead. Wish I’d been able to go – next time, I hope! I quoted some of your Second life responses around the office after i watched it, as i agree that some people are jumping into Second life without really thinking about it first, and in an academic world, using a technology because its there just doesn’t work. There needs to be a purpose. Second life has powerful potential, but i believe it needs to be thought about when integrated into the classroom. I have only briefly used Second life (my home machine just doesn’t hack it, and time is always an issue :-)), are there any updates on accessibility, i was reading an article from november last year, where at the time SL was not accessible to blind users, is this still the case? does anyone know? Here in the UK, SL is getting greater and greater prominance, a year ago you didn’t hear mention of it in the HE sector, now it crops up at most conferences and events, it will be interesting to see how it grows. I’ve heard peoples concerns about it being a fad, and not lasting, for me its too early to make that prediction. Yes, I thought at first I’d be going head to head with the Microsoft and Bb dudes, but they kept us at a safe distance ;-) Actually they were quite nice people. And really the focus on the show seems to be more on campus administrators; there could have been a third/fourth episode on pedagogy. This has been in an open tab for over a week while I was travelling and I finally got a chance to view it today. Good job Alan! I loved the line “why do buildings in 2nd life have roofs? it doesn’t rain!” Casey Greene does a great job as facilitator, and it was really interesting to hear from some of your academic co-panelists; both Sandra and Gil made some great points. Your point about Web 2.0 not being just one monolithic “product” was important. You also made the very intelligent point that maybe we need to do a lot more integrating with the wave of technology already available out there. That’s certainly been an important concept for me in leading my organization down the web 2.0 pathway. So much is available –for free! A little innovation, vision, and creatiity goes a long way right now. It’s at least as difficult to grasp the radical aspects of web 2.0 technologies as it is to conceive of building a building without a roof–whether it needs one or not. Jaiku: Coming Soon on Betamax?